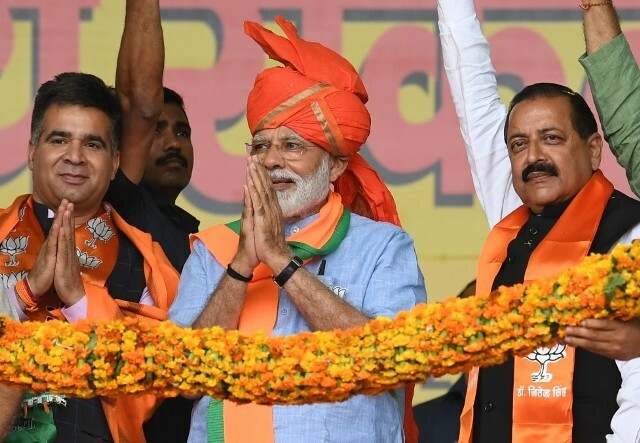 Kathua,April 14 (Scoop News)- Prime Minister Narendra Modi on Sunda blamed two political families of Jammu and Kashmir for what he called the ruining the three generations of the state. Referring to Baba Saheb Dr BR Ambedkar, Prime Minister said dynastic rule is the biggest threat to democracy. PM Modi said voting against dynastic families will be biggest tribute to Baba Saheb. Addressing a rally in Kathua today, Mr Modi slammed the Abdullahs and Muftis, saying two families “ruined” three generations of Jammu and Kashmir and he will not allow them to “divide” India. The Prime Minister also hit out at Punjab Chief Minister Amarinder Singh for skipping Saturday’s event to pay respec to martyrs of the Jallianwala Bagh massacre. He said the wave in favour of the BJP was stronger this time than in 2014. According to opinion polls and surveys, the BJP will get thrice the seats that Congress will win, he said. He said policies of the Congress party were responsible for the migration of Kashmiri Pandits from Valley. Modi said the anti-India stance of Congress, National Conference and PDP is getting exposed by what they are promising in their manifesto.